For bicycle and motorcycle riders, visibility is a constant concern for safe riding. For the designer, minimizing additional demands on the rider’s attention is just as crucial when the device will be used while operating a vehicle, especially a bicycle or motorcycle. 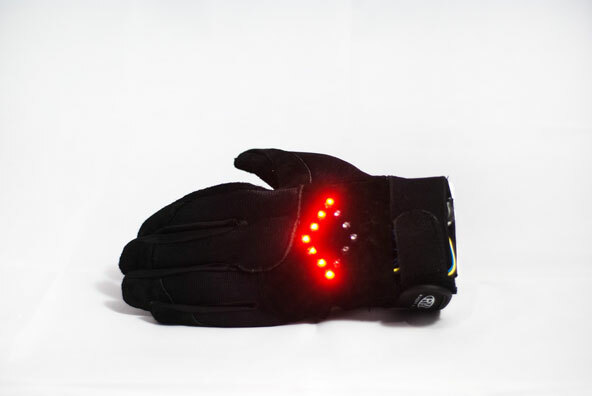 This illuminated riding glove uses off the shelf sensors to recognize common hand gestures used by riders and actuates appropriate LED patterns to enhance the visibility of the gesture. The configuration of LEDs also translates the gesture to an illuminated directional chevron to aid other road users who may not be familiar with the left and right turn hand signals used in North America. 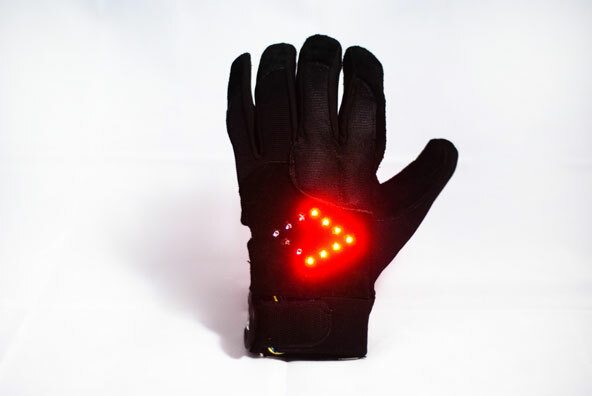 By equipping the device to recognize existing hand gestures, activation of directional LED signals is simplified allowing the rider to focus on riding while the glove responds to and extends the visibility of the rider’s hand gestures. This context awareness allows the device to cooperate with the rider, rather than asking the rider to interact with the device. 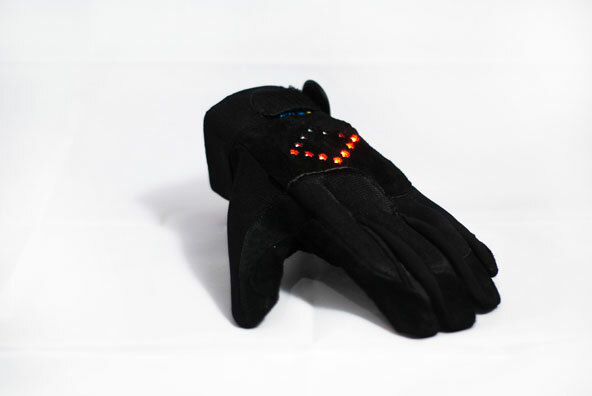 The glove prototype uses flex sensors, a tilt switch, 3mm high flux LEDs, and an Arduino Pro Mini to recognize gestures and actuate the LEDs. 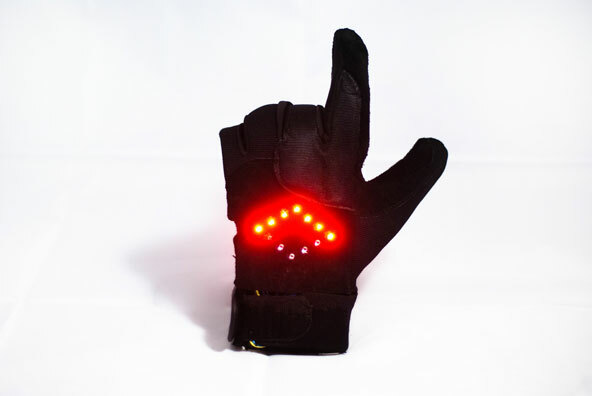 The flex sensors are located at the index and middle fingers, and function to recognize released grip from the handlebars and differentiate between the open hand position for turn signals, pointing with the index finger, or gesturing with the middle finger. 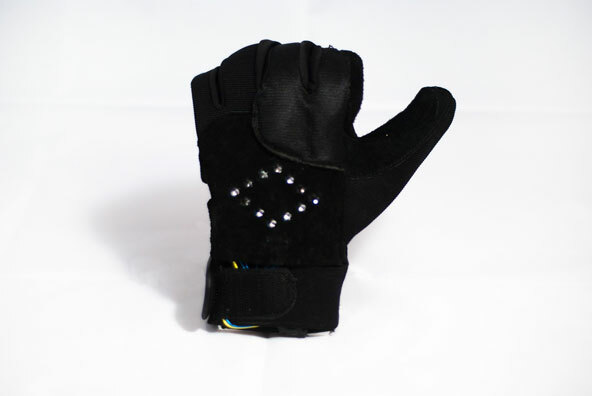 The tilt sensor functions to detect hand orientation to differentiate between left signaling and right signaling. When both flex sensors are flexed, all LEDs are turned off. 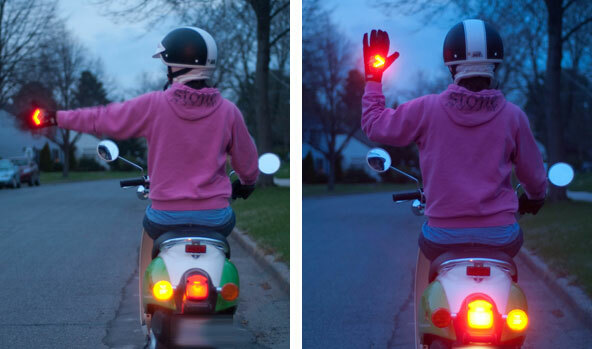 When the hand is closed, the hand is assumed to be wrapped around a handle bar, with no signaling occurring. When both flex sensors are open and not flexed, and the tilt switch is in the vertical position, LED circuits D and L are repeatedly activated and deactivated at 500 ms intervals to create a blinking chevron or arrow head symbol as long as sensor state remains the same. When both flex sensors are open and not flexed, and the tilt switch is not in a vertical position, LED circuits D and R are repeatedly activated and deactivated at 500 ms intervals to create a blinking chevron or arrow head symbol as long as sensor state remains the same. When the index finger flex sensor is open and not flexed and the middle finger flex sensor is flexed, the tilt sensor is ignored. LED circuits D and L are activated and illuminated constantly creating an illuminated chevron or arrow head symbol as long as sensor state remains the same. 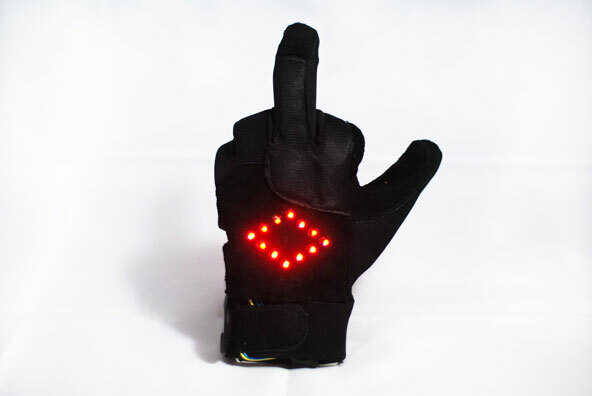 When the index finger flex sensor is flexed and the middle finger flex sensor is open and not flexed, the tilt sensor is ignored. All LED circuits (X, D, R and L) are activated and deactivated at 250 ms intervals creating an flashing diamond as long as sensor state persists.